The shipyard, located in Vigo, Spain, Metalships & Docks, delivered a new offshore vessel to the Owner and North American offshore engineering company McDermott. The Executive Vice President of this International company, Mr Tony Duncan and the Chairman of Metalships & Docks, SAU, Mr Manuel Rodríguez, signed the protocol of delivery of this vessel today in a ceremony which took place in the presence of the Godmother of the vessel, Mariana Vaz; and other authorities and personalities from the social, political and business world in Galicia (Spanish region where is located the shipyard). 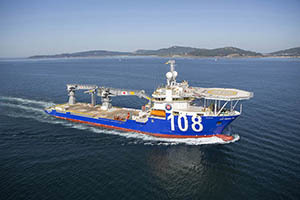 The Lay Vessel 108 is the third project shared between the Inte company McDermott and Metalships & Docks, and the international focus of this shipyard from Vigo. The vessel, delivered today, has an overall length of 133,6 meters, a beam of 27 meters and a draught of 6,85 meters. It has two cranes of 400 and 100 tons, a dynamic positioning system, 5 propellers (3 azipull thrusters and 2 bow thrusters) and compliment of up to 129 people. The vessel can also reach a speed level of 15.0 knots and complies with all the environmental standards in force. The vessel fit for deep water (up to 10,000 feet) subsea pipe-laying, as a support vessel to oil and gas rigs, and offshore construction works that will operate internationally worldwide. McDermott is an International company specialized in subsea tasks which, currently operates worldwide fort the most important oil companies.